Think Faster – Focus Better – Remember More! 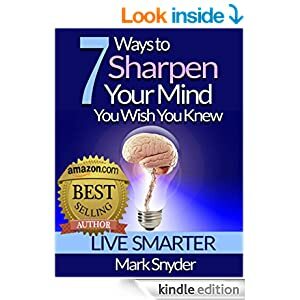 This book presents creative, yet practical tips and techniques to refine and sharpen your memory. Rather than rely on the happy accident of involuntary memory, you will be able to control what sticks in your mind and have easier access once a memory is in there. Now, there is no shortage of memory books and tools out on the market today. The problem with them is they require you to use highly technical systems, so that to improve your memory, you have to learn, understand, and apply a complicated set of instructions. This can be time consuming and require a lot of effort. Often the system that you are taught is useful for only a handful of situations. It might help you with remembering names or a grocery list, but fall short in other areas such as studying or test taking. This Book takes a different approach. It provides you with tips and techniques that are easy to learn, and more importantly, easy to apply. It does not require that you waste time learning difficult systems. It offers techniques that work with the natural way your mind processes information, so you spend less time trying to remember a system and more time remembering the information you need. * The basic principles of improving your memory. * The importance of eating smart. * Organizational tools and methods. * How to work your mind. * How to stress less.